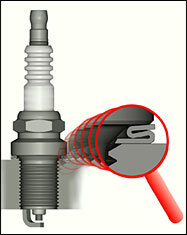 Spark plugs are constructed by using two different manners of sealing in cylinder head. 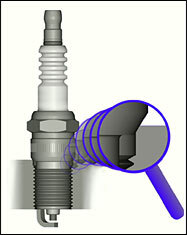 Spark plugs can never be mounted into cylinder head without a sealing washer. In such a case the combustion area is not sealed sufficiently and heat removal into cylinder head does not work well enough. Vehicles produced in series (which are not additionally modified for engine power output enhancement), whose engines are properly adjusted and in good technical condition, can be equipped according to the current application tables. Any comparison charts of spark plugs are always for informative purposes only and they do not substitute the current application tables in full. In the case of engine power output enhancement by means of additional modifications it is suitable to contact a producer's representative. There always applies a principle that in the case of medium modifications of the power output it is suitable to use the spark plugs "colder" by 2 degrees than those forming its original equipment (e.g. a change from 15 to 12). After driving several miles and subsequent assessment of the insulator tip appearance it is possible to decide about the most suitable equipment. This operation requires enough experience.